Labels, by Georgia Young, Durham, North Carolina, 2017. Labeling of difference is not new, and was used in the women’s suffrage movement to discredit women, symbolized in this piece by the suffragette in the background. The proceeding layers of the piece serve as the events, such as trauma or genes, which could affect someone and result in different behaviors than are socially accepted. Among the layers are the labels that one who expresses themselves differently may hear, such as “insane”, “mad”, or “dangerous”. 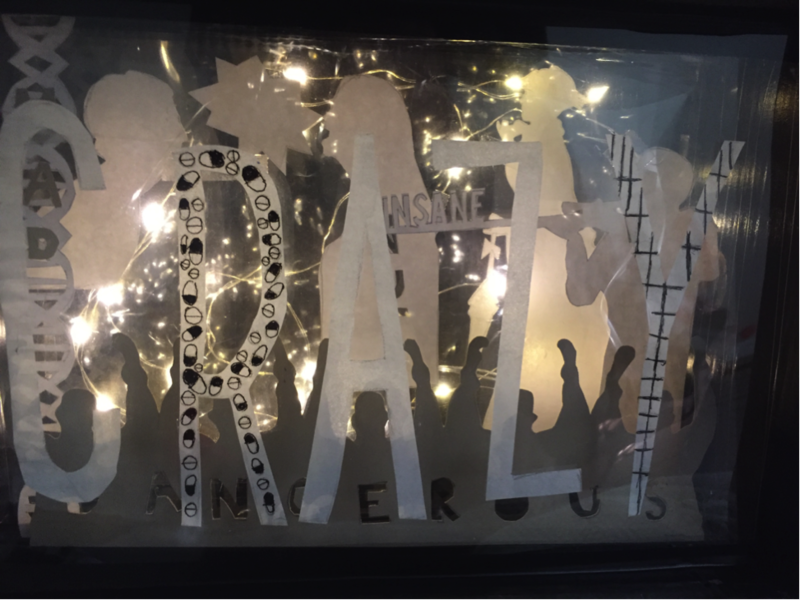 The top layer, which spells out the word “CRAZY”, obscures the images behind it, just as the label “crazy” obscures the true depth of a person. On top of the word “crazy” are pills and jail bars, showing the ways that society tries to alter a person or separate them from society once they have been labelled.